I hope somebody can help me. I'm trying to conduct an analysis which examines the number of samples of Hymenoptera caught over an elevational gradient. I want to examine the possibility of a uni-modal distribution in relation to elevation, as well as a linear distribution. Hence I am including I(Altitude^2) as an explanatory variable in the analysis. I am trying to run the following model which includes a Poisson error structure (as we are dealing with count data) and date and Trap Type (Trap) as random effects. Clearly I am making some big mistakes. Can anybody help me figure out where I am going wrong? (you saw this warning mixed in with your error messages). 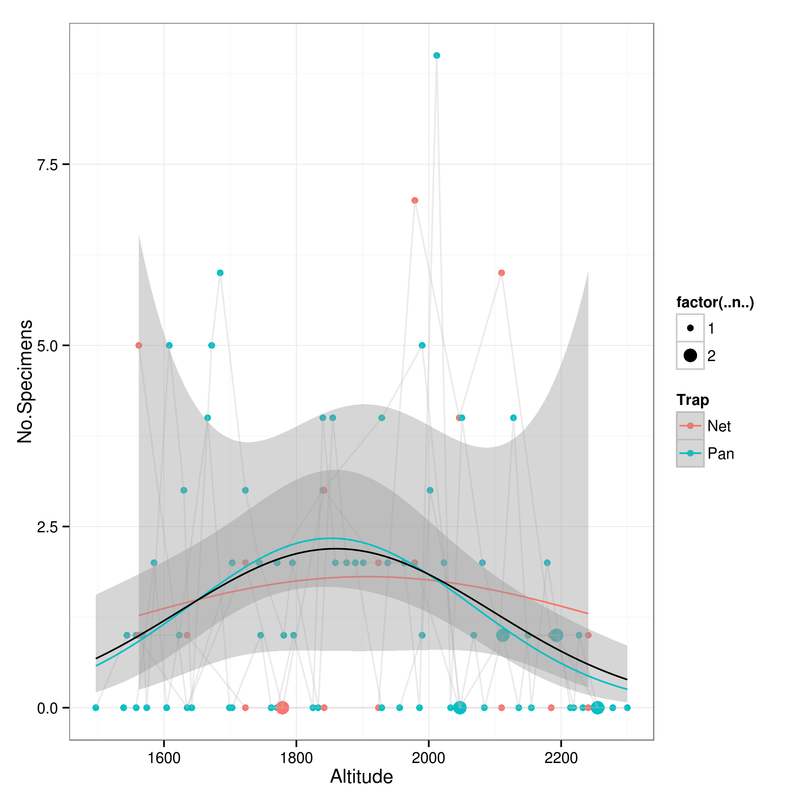 The only continuous (and hence worth rescaling) predictor is Altitude, so I centered and scaled it with scale() (the only disadvantage is that this changes the quantitative interpretation of the coefficients, but the model itself is practically identical). I also added an observation-level random effect to allow for overdispersion. The results seem OK, and agree with the picture. ## (Intercept)  0.53166    0.31556   1.685  0.09202 .